The North York Moors National Park combines dramatic coastal scenery and wild upland moorland with beautiful rural scenery and interesting villages. In addition to these basic ingredients, there are many points of interest from industrial heritage to ruined abbeys and a steam railway. With a well developed network of footpaths and bridle ways this National Park provides a wonderful range of walks. 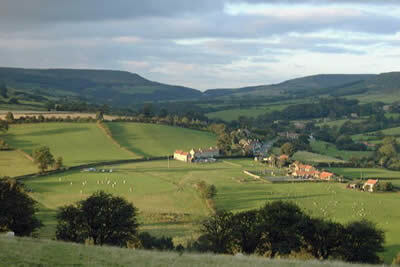 The North York Moors National Park is an area of breathtaking beauty. A potent mix of heather-clad moors, secluded dales and a rugged coastline it provides a superb area for walkers to explore. Containing the largest expanse of heather moorland in England and Wales the upland areas contrast with the carefully tended farmland in the dales. The coastline has suffered little from people. With superb views, a fascinating history and varied the sea adds an extra dimension to the National Park. The area has been inhabited for thousands of years, with the people changing and moulding the landscape to suit their needs. Bronze age burial mounds, mediaeval castles and abbeys, and 19th century industrial relics all have their own particular significance and provide further reasons for exploring the area. Despite having many square miles of moorland the North York Moors is the most wooded of England's National Parks. Ancient woodlands and working forests provide valuable much needed income, homes for wildlife and a landscape for us to enjoy. Covering some 554 square miles (1436 square kms) the highest point in the Park is found at Urra Moor with an elevation of 1490 feet (454 metres) above sea level. The coastline for the most part rugged and wild has some tremendous cliffs with the highest to be found at Boulby where they ride over 600 feet from the sea. The upland areas can be conveniently be divided into three main ranges. The Cleveland Hills dominate the north-west and offer views extending north over the River Tees in County Durham. In the south-west the Hambleton hills have a character of their own and offer wide panoramas over the vale of York. The third and final range are the lesser known Tabular Hills. These offer good views south over the River Derwent to the Yorkshire Wolds. The Cleveland Way National Trail has become increasingly popular in recent years. Some 110 miles long (177 km). Providing a challenging route it offers walkers a interesting and varied look at the National Park combining an excellent mix of moorland, valley and coastal walking. The historical background to the area is diverse and full of incident. The Abbeys of Byland and Rievaulx provide stark evidence of the Reformation. In contrast to the quiet life of the ecclesiastical centres, the Roman Road and Helmlsey Castle remind us of the struggle for land ownership was long running and often bloody. A full list of "Where to Walk" Walking Guides can be found at List of Regional Walking Guides.